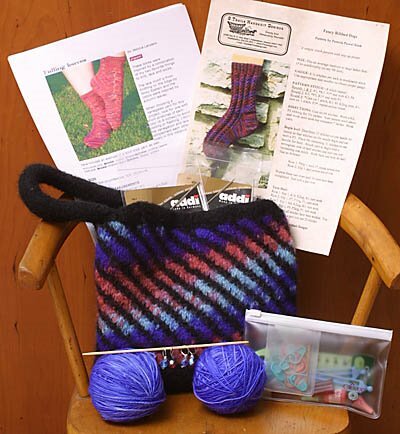 Sittin 'n Knittin: KSKS Kit Arrived! My kit arrived the other day, from Lori in Texas (sadly blogless)!! The bag pattern is her own, and the beautiful yarn is hand-dyed superwash in a beautiful violet colorway. You don't see it skeined, because as soon as I ripped into the box and saw the yarn and the Falling Leaves pattern I pulled out T's scientific scale to wind up 2 balls of equal weight. You will also note not one but TWO Addi Turbo 16" size 0's. That's right--I'm going for my first attempt at 2 socks at once. Thanks, Lori! I sure appreciate the generosity. Look for photos of the WIP soon! I love the bag design your partner made! Great hand-dyed too! Those are going to make beautiful socks. Thanks for your post on our blog. I just wanted to say that it is interesting to read her response to your email. She's probably a perfectly nice person (one would hope, anyway). I went looking at her eBay site and found some different wording there yesterday, so maybe she did actually change it. Anyway, happy knitting on the 2 socks at once!